American International Medical University (AIMU) held its eighth annual Convocation and White Coat Ceremony at the Royalton Resort, St Lucia on 29th September 2017. The event was graced by Her Excellency, Dame Pearlette Louisy, the Governor General of St Lucia. The chief guest was Mr. Kenneth Monplaisir, QC. The ceremony began with the arrival of the Governor General and the National anthem. The process of graduating students and white coat recipients into the convocation hall followed. The Academic Procession was led by the Chief Guest, Mr. Monplaisir followed by the AIMU Vice-President of Administration, Mr. Urban Dolor, the Dean, Dr. John Klir, the Associate Dean of Medicine, Dr. P. Ravi Shankar and the Associate Dean of Nursing, Ms. Grissel Leon. The Masters of Ceremonies for the evening were Ms. Gbemileke Omotoyinbo & Mr. Chukwuebuka Emechebe. The event got underway with Christian, Muslim and Hindu prayers reflecting the diversity of the academic and student body at AIMU. In his welcome address, Dr. Klir stressed the importance of the noble professions of medicine and nursing and requested the graduates to stay in touch and to let their alma mater know how they are doing. The white coat ceremony for students who have completed their basic sciences followed. Dr. Satyajit Patra, Associate Dean of Student Affairs presented the candidates to the august gathering while Dr. Gabriel Dakubo, Professor of Microbiology presented the white coat and Dr. G Swamy, Clinical Dean, presented the stethoscope. Dr. Swamy administered the oath to the white coat recipients. Among the recipients were AbiramiSree, Aniqa Islam, Anvitha Reddy, Feba Thomas, Lawren Paul, Maksuda Akter, Manaswini Chowdary, Muhammad Khizar, Pooja Chowdary, RP Chueliydao, Regash John, Reshmika Elangovan, Ruchandar Babu, Sainikhil Konduru, Suraj Kumar, Selvin Romario, Shivani Modi, Shivani Mallela, Vinay Kumar, and Vishnu Byroju. In his address, Dr. Christopher Rose, Professor of Behavioral Sciences and Medical Ethics stressed the need for constantly updating one’s knowledge and the fact that medicine and nursing are lifelong callings. He also stressed the similarities between St Lucia and Canada. The Graduation Ceremony commenced with the address by Mr. Dolor. He stressed how AIMU is preparing for accreditation and the various initiatives which have been undertaken to strengthen the curriculum. He also informed the audience that Dr. Rose is available to provide personal counseling to the students. He also introduced the Chief Guest, Mr. Monplaisir. The Chief Guest in his address stressed the various changes which have taken place during the last six decades and how technology is strongly influencing medicine. He welcomed all the graduates and congratulated them on their success. Dr. Patra presented the Graduates and the Chief Guest presented the certificates. Dr. Shankar in his address stressed the importance of the history of medicine and the development of Hippocratic oath. He administered the version of the Hippocratic oath modified by Dr. Lasagna to the newly graduating doctors. Mrs. Leon provided a brief overview of Florence Nightingale and administered the Nightingale Pledge to the newly graduating nurses. Among the doctors who graduated were Adhav Muralidharan, Anju Vijayan, Arul Kandasamy, Ashley McPherson, Candida Dhanaraj, Clarence St Hilary, Ganga Pratiek, Jane O’Connor, Jaishri Jaygopal, Jeby Joseph, Jerry Joseph, Kon Jumshi, Love Aremu, Maria Hasapogolu, Maricel Anayas, Menaka Kangaratnam, Michael Levin, Myla McLean, Nancy Daniel, Nilofer Khan, Paul Socrates, Pingala Ramkumaran, Rakul Ranganathan, Sam Nishanth, Serena Mathew, Sini Saju, Sophia Sampath, Sunday Iziago, Victory Vilox, and Vigneshwaran Sundarrajan. 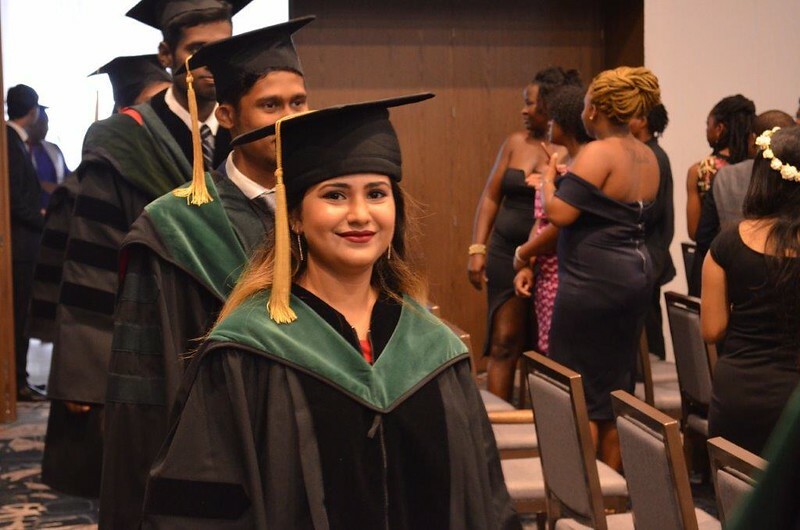 The doctors who graduated in absentia were Akila Kasippan, Bessie George, Bivy George, Hamza Karim, Jennifer Benjamin, Kavya Karangada, Mir Mustafa, Naveen Raj, Naaz Nasar, Nola Duncan, Pavan Deepak, Roshan Srinivas, Sharon George, Sneha Maria, Sneha Pandit, Sukhdeep Randhawa, Suleman Khan and Yohan Mathew. This class truly reflects the diversity of the AIMU student body. Among the nurses who graduated were Asha Reynolds, Bolanle Coker, Davina Emanuel, Emelia Bankole, Glory Onydeikachi, Jozeete Philogene, Ikpeba Cynthia, Nyan Ephraim, Taliah Doctrove, Tanisha Auguste who received their certificates in person. Whitley Deterville and Vivian Ufondu received the certificates in absentia. Dr. J.Rambally, a board member of AIMU distributed the certificates to the best outgoing medical and nursing students. The best outgoing medical student was Dr. Candida Dhanaraj and the second best was shared between Dr. Nilofer Khan and Dr. Naaz Nasar. The best outgoing nursing students were Ms. Ikpeba Cynthia and Ms.Jozeete Philogene. In her acceptance speech Dr. Dhanaraj mentioned six rules for making it through medical school. Dr. Khan started her speech with a moving poem devoted to her late mother. A recording of the brief speech by Dr. Nasar was presented. The nursing student Ms. Cynthia mentioned about her experience as a nursing student at AIMU while Ms. Philogene thanked her teachers, classmates, parents and others. Dr. Aisha Cox, Assistant Dean of Prehealth, provided the vote of thanks. She thanked various dignitaries who graced the occasion, the faculty members, staff, and Dr. Patra and Ms. Sahana Salins, the Registrar for making the Graduation ceremony a success. She also thanked all the graduates for choosing AIMU as their alma mater. Floral bouquets were presented to honor the Governor General, the chief guest, Drs. S. Tobias, and E. Tobias and Mrs. Lecenta Desir-Dolor. After this there was a photo session of the newly graduated doctors, nurses and white coat recipients with the faculty and dignitaries. The program was followed by Dinner.